Known as one of the most cosmopolitan cities in Asia, Bangkok is also known for its traffic! In Thailand, a total of 37 million hours is spent travelling to work everyday. The average working person living in Thailand spends 2 hours everyday travelling to and from work—because of this, a lot of transport modes exist to make commuting a breeze even for the Bangkok novice. These modes of transport, which fits every kind of budget and need, ensure that you will eventually get to your destination despite the congested roads! Non-metered taxis are also available but are usually more expensive, so one must negotiate the rate. A trip within central Bangkok should cost between 60 – 80 Baht (plus an additional 10 – 20 during peak hours). The trip to the airport is about 200 – 300 Baht. Whether meter or non-meter, the freeway tolls (20 – 49 Baht) are paid by the customers. The ineffable tuk-tuk, or samlors, are usually faster than taxis in traffic jams as they can weave in between cars, but you must be prepared for inhaling a day’s dose of traffic fumes. Tuk-tuk fares have escalated and they are now on par with metered taxis. Be prepared to pay about 40 baht for a short hop, or better yet, negotiate with the driver before you take the ride. 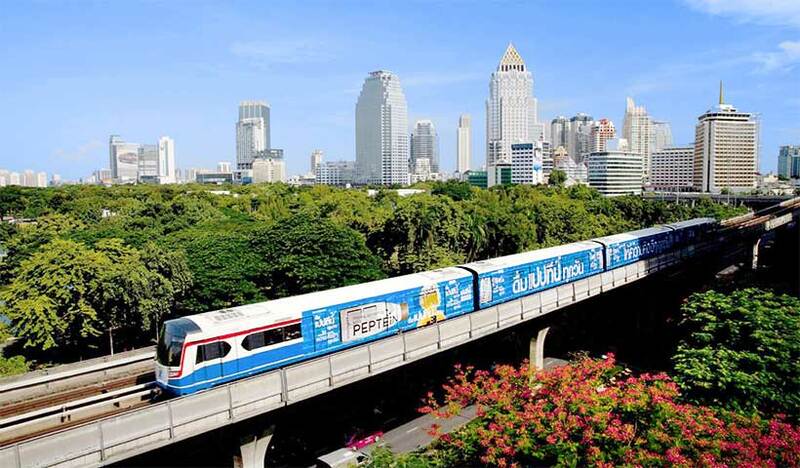 By linking several hotesl, shopping centers and business districts, as well as the Queen Sirikit National Convention Center, the subway can definitely help you reach your destination on time. The State Railway of Thailand (SRT) runs express, fast and ordinary services throughout the country at very reasonable fares. There is also a train service between the city center and Don Mueang Airport. One can save a fair bit of money by making use of the public bus system, and they are comfortable as many buses on the main routes are air-conditioned. A non air-conditioned ride costs around 6 baht, while adding just another 5 baht lets you travel in air-conditioned comfort. Routes are numbered and indicated on most tourist maps. However, you are advised to guard your belongings when traveling on buses as they tend to be very crowded. There are also micro buses which charge a uniform fare of 25 baht and accommodate a maximum of 30 passengers. Euro buses are also in service and theses between 10 and 18 baht. The most pleasant way to get around Bangkok is undoubtedly the shuttle boats plying Bangkok’s waterways. They are faster and much more interesting. Although many of the klongs (canals) have been paved over, there are still a number of routes to be savored, e.g. along the Chao Phraya River and the adjoining canals. Fares range from 6 – 10 baht. Traveling around Thailand is a delight with booking domestic flights operated by Thai Airways International, Bangkok Airways, Nok Air, Air Asia and Orient Thai.